1. In a frying pan over medium heat, fry bacon and onion until bacon is crisp and onion softened. 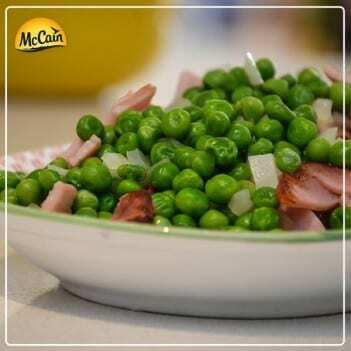 Add McCain Frozen Peas, cover and cooked until the peas are warmed through. Serve immediately. 1 In a frying pan over medium heat, fry bacon and onion until bacon is crisp and onion softened. 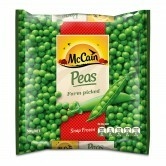 Add McCain Frozen Peas, cover and cooked until the peas are warmed through. Serve immediately.